Never mention two words around me: Ken or Burns. If you do, I will launch into a diatribe about the failings of the American education system and cry out, "Why can't they just teach things in context!?! My god, give those kids some context - just like Ken Burns does!!!" Literature without historical context? Nice stories. Art and music without history? Just pretty paintings and catchy tunes. Calculus without physics? Freakin' confusing and charty. Spanish without plans for an amazing trip to Buenos Aires or Barcelona at the end? Pointless. In high school, you might be studying Chinese imperialism while reading Gatsby and listening to Mozart. It's all taught in silos. You eventually piece things together, but it could have just been taught the fun and interesting way the first time around. Kids would be running around, pumping their fists in the air, exalting, "My god, it all makes sense!" Yes, I'm sure they would. This context is absolutely vital for understanding modern art. To understand the war years and the aftermath is to understand Picasso's cubism and Pollack's splatters. 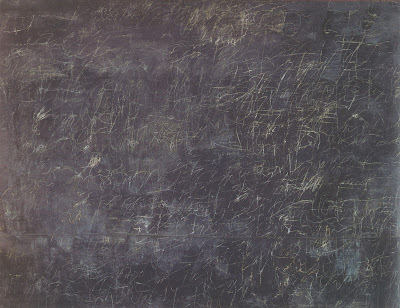 But even with context, I never got Cy Twombly. He scribbled and smeared and I just didn't like it. Adding "Zeus!" to what looked like a preschooler's tantrum on canvas? That's not art, I told myself (while frustrated with my aesthetic narrow-mindedness). But then I got some very cool, seemingly local gossipy context in art history class at Washington & Lee University. Cy grew up in Lexington, Virginia and his dad, also Cy (after Cy Young), was athletic director at the college. The professor explained that Cy, the artist, was never understood by Cy, the jock, and that their tensions haunted him for much of his life. As much as he reeled from the fratty, macho environment of W&L and his home life, he actually poured it into his art. His gray paintings aren't just gray canvases with scribbles, the professor explained, they're symbolic of his dad's work, figuring out plays for the football team on a chalkboard. "My god, it all makes sense!!!" I'd like to think that all those chalkboard paintings are all meant to show us all that there is no real playbook for fathers and sons - that it's all just a mess and you have to play the game anyway. None of the non-factual parts of that tale may even be remotely true, but it did provide the context (faux or not) I needed to appreciate his art. Cy died today in Rome - his other more artsy home - at 83. Thank you Hollister for all students of the world!! So well put. Also for appreciating Cy Twombly (in context)! Saw the Twombly and 'in context' and rolled my eyes--but by the end it made sense; and a kind of sad sense at that. Thank you! It wasn't until much later in a College Renaissance Art History Class, that medieval manuscripts wormed their way into my heart - why images that seemed flat and stylized before were suddenly alive with mysterious iconography, mistresses painted in the guise of virgins, and advances in artistical techniques! I was hooked, line and sinker, from then on! I loved the insight to Twombly's work, so thanks for that. I taught for 28 years, but I taught 5th graders, in a block where I was responsible for language and history. The only method that makes sense is to teach as you described, and to get the art and music teachers on your side. I taught reading writing and writing through the context of American history. I'm telling you, my kids loved history! What a gorgeous eulogy. I am strangely glad I first received news of this on your blog -- it beats reading it from AP. I can appreciate your feelings on Ken Burns. Now there is a whole segment of the USA who thinks history has to be filled with dour narration and banjo accompaniment. He also has lead us to treat our own history as a secular Hagiography, filled with righteousness that is tested by triumph over the occasional sin that only pops up like some Whack-A-Mole game.